Ford Australia's official press release photo, 1st July 1925. Over 10,000 miles away in Canada and USA, decisions were being made that would affect every distributor in Australia including Duncan Motors Ltd. On 10th September 1924 Wallace Campbell, Vice President of Ford Canada dispatched a letter to Edsel Ford in Detroit outlining the proposals from the French Report recommending setting up and manufacturing Ford products in Australia. In simple terms, without their knowing or previous discussions every state distributor including Duncan Motors Ltd. was going to be downgraded to a dealer effectively ending their monopolies. Three months after Ford USA and Ford Canada had made their decision, French and five others were on a boat and on their way back to Australia. Upon landing one of their first tasks was to find a suitable site for the factory. They secured 100 acres near Corio Bay in Geelong. They also secured land for assembly plants in all the states except Tasmania and the Northern Territory. On 31st March 1925, Ford incorporated two companies. The Ford Manufacturing Company of Australia and the Ford Motor Company of Australia. Each had a capitalisation of £1,500,000. Split for tax purposes, they in effect operated as a single unit with Herbert French as General Manager. Wallace Campbell, Vice President of Ford Canada was also named as one of the four directors. One of the first actions of the infant Ford Motor Co. of Australia was to block all six state distributors from importing any more cars from Canada and “encouraged” them to use their stocks. At the time is was offered as a strategy to combat the huge stocks of cars each state was holding due to the declining market. In reality it starved the distributors and the market effectively creating a “vacuum” for the new company to market it’s product. The sales of Ford cars were already falling in South Australia when French arrived prior to the setting up of Ford Australia. The last three months of 1924 saw 263 Fords sold. January 1925 only confirmed the declining trend with only 66 cars sold. Although sales for February in South Australia reached 143 Fords sold, neither Duncan Motors Ltd. nor Ford Australia would ever reach this number again in South Australia with the humble Model ‘T’ Ford. French’s strategy of not allowing the distributors to restock was hurting Duncan Motors Ltd. March saw 125 Fords sold, April 92 Fords sold, May 65 Fords sold and June only 42 Fords sold. For a business structured to making and selling around 200 to 250 cars per month, the lack of stock generated reduced sales revenue and therefore seriously restricted cash flow. Adding the costs of developing the new body, the business was in a very tight and precarious financial position to say the least. The Duncan’s had to rethink their business strategy for 1925. How do they keep their businesses afloat? What can they do? The new factory at Franklin Street was finished and body building was under one roof for the first time since the fire. The assembly line at Mile End was running fine. The operation was now back to full capacity and running smoothly, but for how long? When Ford did set up, how were they going to make a car? How can the Duncan’s be part of this to preserve their business interests? The Duncan brothers did what they did best and that was coach building. It was quite obvious to the Duncan’s that when Ford did set up they could only be assembling cars to begin with. They would need a body and an assembly line. Adelaide and the Duncan’s already had a Ford assembly line, even though Ford Canada did not own it. Indeed, they did’t even know about it. That left only a body. The Duncan’s set about with their gifted crew designing a body. It would have to be simple, cheap to make, able to be shipped in a knocked down form around Australia, suitable for the national market and styled similar to the competition bodies. Most importantly, how can they ensure that Ford use only their body only to guarantee volume for Mile End? The answer was the fuel tank. Lowering the front seat height necessitated a new fuel tank. The Duncan’s designed and had locally made an 8 imperial gallon rectangular tank instead of the standard Ford 8 imperial gallon oval tank. This allowed the front seat to be angled back for improved comfort and lowered the desired amount of about 2”. The rectangular fuel tank design feature ensured that this body it could not be bolted straight onto a standard Ford chassis. I believe the Duncan’s plan was to continue to utilise Mile End and the modified imported chassis, manufacture the body at Franklin Street and assemble the cars at Mile End. Once assembled Ford cars could be centrally dispatched from Adelaide for the national market and thus guaranteeing their survival, for the interim at least. With a sound business plan, the Duncan's took the calculated risk. The body was streamlined to say the least. It was officially a 5-seat tourer. But the new design came basically straight back from the windscreen without a "belly out" curve. Although this straightening of the body made it simpler to manufacture, it considerably narrowed the front seat width. Two average size adults being hip to hip in the front making it quite “cosy” to say the least. The windscreen was a lowered 2-piece design, a carry over feature from the previous model and typical of the day. What was unique to this body was the bottom half had a curved bottom mirroring the new cowl shape. This eliminated the need of a piece of wood fitted onto to cowl which was used to fill in the gap and seal the bottom of the previous model’s square windscreen frame. This had the effect of smoothing out the windscreen and cowl areas and thus modernising the look of the car. A new hood was developed to suit the lower profile windscreen fitted with a rectangular glass rear window. The new car now stood at around 6’8” and was the lowest Ford touring body that Duncan & Fraser Ltd. ever made. The cowl was of a spot welded construction, a carryover their well tried and tested manufacturing techniques from the 1921-24 tourer and roadster bodies. Also on this model was the tight, crimped panels giving a clean edge, another carry over technique used on their standard 1921-24 tourer and roadster bodies. Integrated into the design was internal door hinges as used on other locally manufactured T.J. Richards & Sons and Holden made bodies. These door hinges, unique only to this model had no hinge visible on the outside lines of the body. This feature gave the body a smooth, uninterrupted appearance. These hinges also included an integral check strap that limited the door opening. Another unique design feature of these hinges is the doors can be opened 90 degrees to the body, lifted up about ¼” and door can be removed from the body. No straps, screws or pins required. In theory, the doors can be made in jigs and interchangeable with another body. A truly remarkable achievement. Unusual in this model alone is the two-piece dashboard. Although still mounted with a standard Ford switches, it's construction was of wood and painted black. 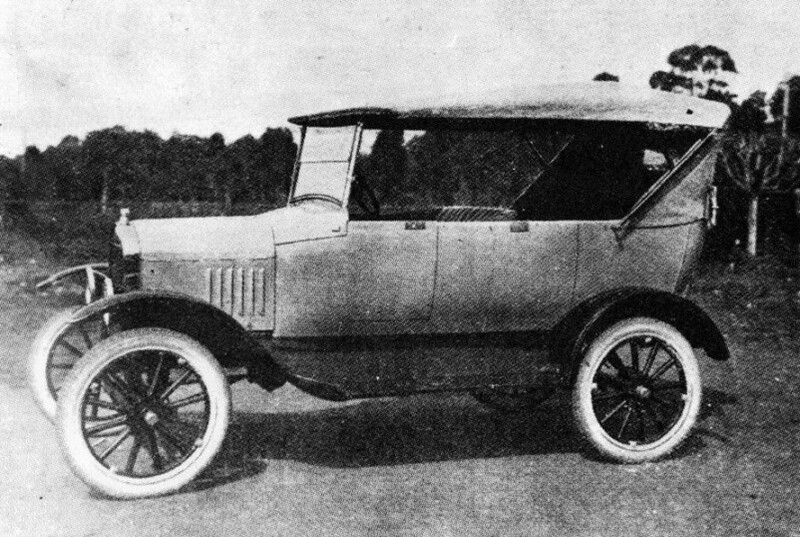 The 1921-24 bodies had a pressed steel dashboard of neat, one-piece construction. Why the visually backward step of wood and an untidy two-piece construction? There must have been a reason why. Was it the cost of tooling perhaps? Or was there intervention from an outside party? We do not know the answer for certain. When exactly the concept of the ‘25 was born or conceptulised by the Duncan’s has proven elusive. What is known today is the evidence left by the body itself. It has none of the finesse or quality of a normal Duncan & Fraser Ltd. body. The body was conceived and built in a hurry. It is believed by some that the body itself was left unfinished. It was simply enough to perform its function and no more. Further adding to French’s problems, setting up the plant in Geelong came with severe restrictions. A complete factory would take about 3 years to build. So a car built from scratch could not even be considered until at least 1928 at the earliest. The next option was to import panels and assemble a car. Ford USA and Canada were already in the throws of retooling for the “New Improved” 1926 model with all steel panels. Neither factory was anywhere near ready for production. That meant importing the old Canadian body that was totally different to anything currently being offered by the current distributors. If French implemented this option he would be guilty of adding another body variant into the Ford market. The different makers and body variants had been one of French’s strongest criticisms and one of the main reasons for setting up a manufacturing plant in Australia in the first place. This left using a current body until the new all steel paneled body was ready to import. But from where? An interim body could not be bought from Holden’s or T.J. Richards as they were building bodies for Dodge and Chevrolet amongst many others. Buying a body from them for the Ford would be supporting the competition. Ironically the Holden plant at Woodville was the former Kilkenny site sold by Duncan & Fraser Ltd. in 1923. Much to French’s displeasure, he had no alternative but to use what was on offer. The Duncan’s, with their new body and assembly line to offer, had succeeded where every other state distributor had failed. Through the industry it had been widely speculated that Ford Australia would be making a significant announcement at the end of the financial year. Speaking to the Duncan family, apparently the Duncan’s were initially offered central assembly and national distribution rights from Adelaide until the Geelong factory was up and running if they could be ready for the announcement. This does explain why the Duncan’s continued to support French. It also explains why the management of Duncan & Fraser would continue to financially drain the business developing a new body with little sales relief and reduced cash flow. In hindsight, their support came at their cost and ultimately the detriment of their very existence. If French did indicate that the Duncan’s would have these assembly and distribution rights, then what actually happened during this period was unethical to say the least. Back in Geelong, French sought his own assembly area. He rented a large wool store from Dalgety & Co. in Gheringhap Street. Just prior the announcement, with no chassis arriving in Adelaide for assembly, the Duncan’s worst suspicions were confirmed. They were instructed to ship their bodies in a knocked down form via rail to Geelong. The car would be assembled at the Geelong rented "Dalgety" wool store, hence the name. French’s apparent reneging of their gentlemen’s agreement coupled with a mutual dislike for each other was a bitter blow to the Duncans and they felt quite strongly that they had been betrayed. This explains why the body was not finished off as neatly as every other Duncan made body, for example the cheap 2-piece wooden dashboard. The Duncans simply stopped wasting anymore of their time and money. French initially ordered 5,000 bodies. Apparently there was talk of another possible 2,500 bodies to top up the initial order. Duncan & Fraser Ltd. had no option but to supply these bodies through Duncan Motors Ltd. in an attempt to recoup some of their lost finances. The crucial part of the Duncan's plan to maintain volume through the Mile End assembly line had failed. “The new Ford Touring Car is much improved over its predecessors. The body has better lines, is more comfortable and more convenient in every way. The scuttle merges into the bonnet in a much more graceful manner than did that of the old model, whilst a better type of windscreen and hood are fitted. The body is fitted with four doors so that the driver does not have to squeeze past his front seat passengers, when entering, or leaving the car. The seats are set low down, so that one actually sits in the car not on it. The upholstery is of a very good quality, Grey Antique Fabrikoid, whilst the coil springs used in the construction of the seats and squabs are of ‘Premier’ wire, said to be the best spring wire produced. The hood and side curtains are made of Biekmyre Canvas, a material which has a very good reputation amongst body builders and tent makers. A rectangular glass light is fitted to the rear curtain. Purchasers have the choice of three body colours, namely Empire Grey, Cobalt Blue and Imperial Buff. The appearance of the car is further enhanced by the nickel-plated radiator shell, headlamp rims, windscreen standard and rim of the rear curtain light. 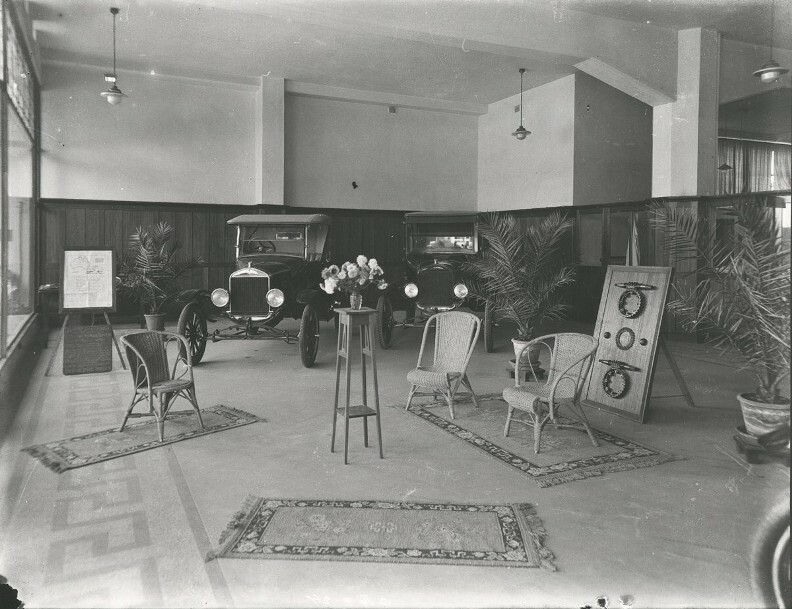 The newly arrived "Dalgety" Ford roadster priced at £185 on display in Duncan Motors showroom, 52 Franklin Street Adelaide, September 1925. The car on the right is a 1925 Ford "Fordor" sedan priced at over £300. Photo B41642 courtesy of SLSA. “I had just arrived in Geelong off the train. I had no tools and no accommodation. So I came back and started work the next day. The car body parts were made in Adelaide and sent to Geelong to be assembled until late 1925. In late 1925, we went out to the new plant. The Ford supply chain also changed significantly at this time. As planned 10 months earlier each state Ford distributor lost their state franchise. All cars and parts were now being delivered directly to Geelong. Ford Australia bought back all existing cars and parts. Every dealer now ordered directly from Ford Australia in Geelong. From an Adelaide perspective, this meant the South Australian made bodies were shipped interstate and whole cars shipped back. The Duncan’s had lost the state monopoly and had effectively been cut off from the outside world. The new car was released, but Duncan Motors Ltd. like every other state could only buy from Geelong. This writer is unable to comment on the situation of the other states, but South Australia was a disaster. The assembly methods in Geelong were clumsy and the time delay of assembled cars coming back to Duncan Motors Ltd. in Adelaide was crippling. National demand far outstripped Ford Australia’s ability to supply. July was a Duncan Motors Ltd. company sale low for nearly 15 years with only 24 completed cars being delivered for the month. Production of the “Dalgety” was slow to begin with, far slower than the widely published figure of 17 cars per day. Other accounts show 678 were produced in July and 747 in August. All of these figures I would dispute. In the absence of any other proof and using my model, Geelong did not assemble 17 cars per day until September. Adding up the 6-month period, the national total made was about 2,751 cars. In 1925 Ford Australia slipped to second place in the market with 14.7% for the first time. General Motors had risen to 16.9%. The question has to be asked how many more Ford cars could of been sold had French decided to use the existing infrastructure in Adelaide and not build it from scratch in a Geelong wool store? Ford sales in South Australia for 1925 reflected the national trend and totaled a dismal 863 cars. Only 330 being the new Ford Australia assembled “Dalgety” assembled model. 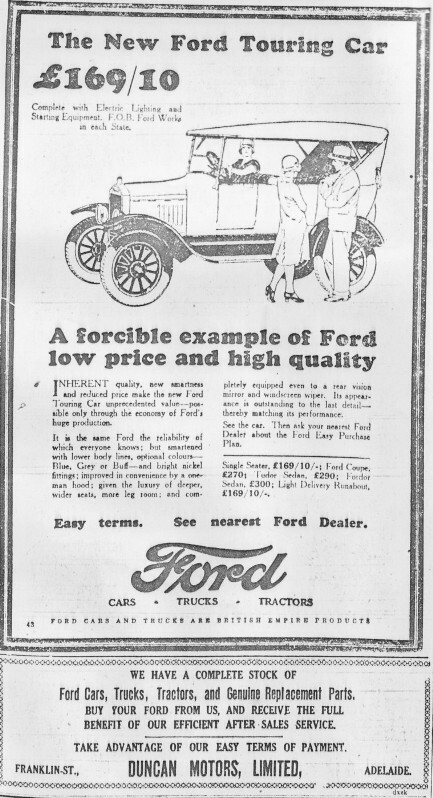 The new 1926 "Dalgety" Ford now price priced at £169/10 as advertised in Adelaide's "The Register" newspaper 8th January, 1926. Duncan Motors tacked their own company advert at the bottom. Photo courtesy of the State Library of South Australia. On 1st January 1926 Ford announced a “new” model. In essence it was still the “Dalgety” 1925 Ford with different wheels and slightly lowered rear seating. Ford didn’t even change the colour options; Empire Grey, Cobalt Blue and Imperial Buff. Even with all the hype of a new car it continued to be a failure in the market place. The “SA Motor” recorded sales for the first part of 1926 in South Australia. January 98 cars, February 122 cars, March 100 cars and winding down for 76 cars for April. Duncan Motors Ltd. sold only another 396 “Dalgety” assembled Fords in 1926. Total “Dalgety” sales in South Australia from 1st July 1925 to 31st April 1926 were a dismal 726 cars. In May 1926 the “new improved” model arrived. The steel panels imported directly from Canada and assembled at Geelong signaled the first car from the new factory. This also signaled the end of the "Dalgety" Ford and body operations from Duncan & Fraser Ltd. Returning my “Dalgety” model above, total production appears to be about 5,261 cars. This averages out to about 526 cars per month. Unfortunately my model does not support that not all of the initial 5,000 bodies ordered were not supplied. However, if the expectation was for another 2,500 bodies making 7,500 in total, then it appears the Adelaide operation was not allowed to supply the remaining bodies. If my model is somewhere near accurate, then the Duncan’s were severely financially disadvantaged by not being allowed to supply the remaining 2,200 plus bodies. One can only guess at the huge amount of money lost by Duncan Motor’s Ltd. and Duncan & Fraser Ltd. The believed treachery and corporate deceit with the body, tooling costs, losing the assembly and distribution rights was topped off with the cancellation of 2,200 plus bodies. Understandably it is difficult today to get the older Duncan family members to discuss 1925, Ford Australia and the French time period. Did you have a relative that was involved in the manufacturing Ford cars during this period? Did they work at the Mile End assembly line or at the factory in Franklin Street? Have you an old photograph(s) hidden away in those old, dusty family albums? Do you have any surviving paperwork, quotations, contracts or company paperwork? Was your grandfather's first car a "Dalgety" Ford?